With summer soon approaching, temperatures in some parts of India like Delhi etc. can rise to about 45-degrees to 50-degrees. So what do you do if you cannot afford a 40-45k Air conditioner? Well, you get an air cooler. And so you do not get overwhelmed by the 100 of products and brands in the market, our guide to the best air cooler in India will help you make an informed decision. Whether you have a large, medium or a small room or if you are only a really tight budget, there is an air cooler for everyone. Symphony HiCool : With a 31-liter water tank, not only does the cooler guarantee you long hours of cooling in medium to small rooms but the honeycomb pads give the best efficiency when it comes to cooling. You also get a remote control, multiple speed settings and tons of other high-end features making this cooler a buy you won’t regret. 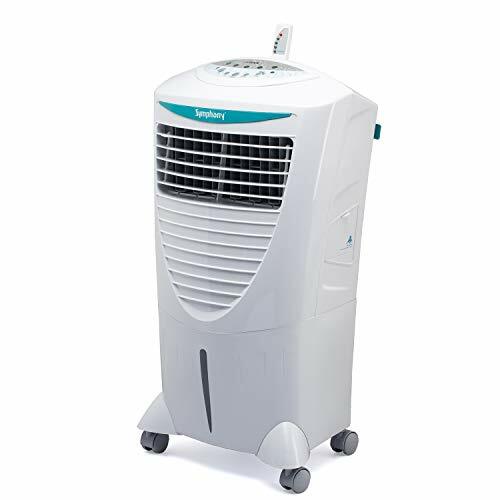 Crompton Greaves Ozone: If you are looking for an air cooler for large rooms, this cooler fits the bill and comes with a 75-liter water tank that gives long hours of cooling even in rooms of size 600 sq. ft. or less and comes with Honeycomb padding as well for lasting durability and low maintenance usage. Symphony Ice Cube: But if you are on tight budget, the Symphony Ice Cube comes under Rs. 10,000 and is also perfect for medium to small rooms with its 25-liter water tank and honeycomb padding. This is first of the few Symphony air coolers you will be coming across in this or any list on the internet. Why? Because the brand is that damn good and the HiCool shows exactly that. One of the standout features of the HiCool is that it is the only cooler on the list that comes with remote control. So if you happen to be as lazy as me, you will be happy to know the remote gives you full power over the air cooler. You can turn it on/off, adjust the timer, select fan speed etc. all with the press of a button (trust me, operating a cooler does not get any more convenient). And when you do not need the remote, you can place in the in-built dock so you never ever lose it. It has 3-speed settings so you can adjust the cooling as per the weather. To ensure that cooling is transferred to every nook and cranny of a medium-sized to a small room, the cooler also features an auto-swing option. The 7-hour timer means you can have the cooler run for the entire night have it automatically turned off even without the press of a button (just what the forgetful you wanted to hear). With the Honeycomb pads, the cooler not only guarantees you better cooling even in the hottest of temperatures but also the ease of maintenance and long-lasting usage. But what if even all that cooling does not satisfy you? Simple, just throw in some ice cubes into the ice chamber to help take the cooling up a notch. The durability of the cooler is not just limited to pads, the Dura-pump technology means the pump will provide you with excellent cooling for years to comes (yup, this is one for the future). It has an air delivery rate of 1750m3/hr which means if your room size is just around 175 sq. ft. or lesser, forget the temperature outside, you can enjoy the feels of the winter breeze within 20-minutes. The 31-liters tank is perfect for everyday use so if you were every about constantly having to fill up the water tank, well, not anymore (will last you an entire day with a couple of top-ups). When the tank does run out of water, the filter will give you a 5-second sound notification while the red indicator continues to blink. 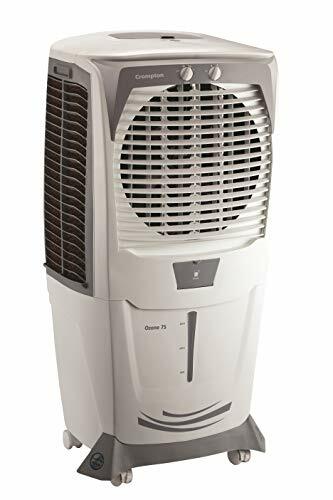 The sleek design, large lockable and multi-directional wheels and a weight of mere 9kgs (lower than any cooler on the list) moving and placing the cooler in any corner of the room a breeze. In case of a power cut, the cooler’s System Restore Function ensure it starts off with the exact same settings or you can get uninterrupted cooling with an inverter as well. And you do not even have to worry about your inverter draining in minutes because the cooler then operates at 40-50% less power. But what about at full power? Will the electricity bills give you a shocker? Not at all, with a power consumption of just 185Watts, the cooler won’t burn a hole in your pocket every month. It also comes with a mosquito and dust filter to maintain hygiene but what really makes the difference is the I-pure technology. So what does this do? It ensures the air entering your room from the cooler is free of any odor, bacteria, allergens or even dust particles as small as PM2.5 with multi-stage air purification system. Its usage is limited to medium to small rooms. Placing it in a bigger room means not only will the cooling take time but you will also need to fill up the tank regularly. The humidity control of the cooler is only just adjusting the pump and water flow and does not really give details about the change in humidity in the room. It will cost you over Rs. 10,000. Plus, turning on the blower makes the cooler a little noisy. Downsides aside, this is the most technologically advanced and convenient to use cooler you will come across in the Indian market and is worth every rupee you will be spending on it for the very same reasons. If you want an air cooler for a large room, it hardly gets any better than the Crompton Ozone 75-liter air cooler in terms of both convenience and cooling. Don’t believe us? Just read below. You know if there is one thing I hate about a cooler it is the need to fill up the tank every 2-3 hours. So how does Crompton overcome that? With a whopping 75-liter tank which can easily give uninterrupted cooling of 9-10 hours without the headache of having to refill (well, thank god for Crompton). Plus, since it comes with honeycomb pads, you can expect 80-85% more efficiency as compared to aspen pads when it comes to cooling both smaller and larger rooms. Not just that, these pads are also easy to maintain and long lasting which means though you might have to pay a few extra bucks, it is value for money. Also, with an Air Delivery Rate of 46000m3/hr. Now, what does that mean and how does it help? Whether you have a large room that is about 600 sq. ft. or a mid-sized room, it takes the Crompton only about 20-25 minutes to give you the wintery feel even at 45-degrees or more (dealing with Delhi summers just got cheaper and easier). Is the room still not as cool as you would like? There is an ice chamber on top. Few ice cubes and voila, it is going to feel like a whole different season. And to help cool every corner of the room, the cooler uses a fan that can throw air to up to 52ft. and inner wings which can be set to rotate with the turn of a knob. You also get 3-speed controls (you want full control over the cooling and you get exactly that). Also, so you are never left guessing about when the cooler water tank needs refilling there is a large water level indicator. And above it is a small pocket it where you can fit in a pipe for easy refilling when needed. No power? No problem, the air cooler works even on an inverter at less than 50% consumption. And even when it running on full power, it consumes just 190-Watts (never a bad deal when you save tons of electricity). Moving the cooler around is also a cakewalk. With 4 wheels, all the cooler needs is a little push. Placing the cooler in the room is no hassle either since it is quite compact. Coverage: Up to 600 sq. ft.
On the downsides, the air cooler does not come with a remote which means speed, swing type etc. all need to be adjusted manually. Also, it is on the expensive side and will cost you over Rs. 10,000. The cooler can cover an area of about 600 sq. ft. The fan can throw air to about 52ft. For large rooms, this is hands down the most high-end cooler. Not only will you get efficient cooling but its durability is unmatched as well. Well, it is got Ice Cube in the name, it better be strong enough to give you the chills in the peak of summers as well. But is really that good? What makes the Ice cube the best budget cooler isn’t just the low price but Symphony’s ability to combine efficient cooling, convenience, and a cost-effective build into one simple air cooler. Not just that, it is also one of the quietest coolers you will come across as it comes with the Whisper Quiet Technology so you get a sound sleep in more ways than one. Even at this price range, Symphony offers you 3-speed settings (low, medium and high) so you can vary the cooling to best match your needs. Plus, you also the get the efficiency and low maintenance usage of honeycomb filters (told you, it is the best bang for your buck). But that is not where the buck stops, the air delivery rate of 1650m3/hr. gives it a coverage range of 120 sq. ft. which means for any small room, this one is a no-brainer as it can cool rooms within minutes. For a wider reach, the cooler comes with an auto-swing option while the I-pure technology ensures that air is free of any allergens, bacteria or foul smells with multiple filters at the heart of it. If placed in a smaller room, the 21-liter tank will give you a 4-5-hour runtime without a refill and thanks to the clear water level meter at the bottom you will always know the precise water levels in the cooler. Not only does the cooler consume just a mere 105-watts of power but will also run on your inverter at half the power. Another feature that makes it perfect for small rooms is the low profile of the cooler and it can be placed in corner of the room since moving it requires minimal effort due to the multi-directional wheels. Lastly, there is also an ice chamber. So in case, the going gets really hot, a few ice cubes should definitely help cool the air further. The cooler works perfectly well in small rooms thus only suits couples, individuals living in a single room or those in need of a personal cooler. Also, the wheels are not very durable and thus the cooler should only be moved when really needed. There have also been complaints of leaks but nothing that cannot be dealt with if taken proper care. I-Pure technology keeps out allergens, odors, bacteria etc. If you want a cooler on the cheap that does not compromise with both cooling and convenience, this the cooler you turn to. Yup, it has its flaws but nonetheless at this price range, you cannot ask for more. if you want a window cooler that does not have to be moved around often and is powerful enough to cool large rooms, this Kenstar Cooler is sure to leave you impressed and is definitely worth the consideration. Let’s start with the basics. Firstly, this too comes with the Honeycomb pads and I am sure you have probably heard enough about how easy these are to maintain and their better cooling efficiency. But if you are looking for a cheaper alternative to these pads, the Kenstar also allows you to use the Wood wool cooling pads. Though you will be compromising on quality, it sure does get the job done on the cheap. Also, it has an air delivery rate of 2250m3/hr. and can throw air at a distance of 35 feet. This means any room within 400 sq. ft. can be cooled in quick time. It has 3-speed controls and a 40-liter water tank so if you run the cooler the whole day, it can give you a runtime of 5-6 hours in a large room with a full tank. And so so you do not have to open the pads to check the water levels, the level indicator has been conveniently placed at the bottom. To keep up the health quotient and prevent the water and pads from becoming a breeding ground of dengue-causing mosquitoes, the cooler has a special dust and mosquitoes filter. Plus, in case you ever find the need for more cooling or need it done on the double, adding some to the ice chamber is a handy trick. Though it consumes more power than the Symphony HiCool at 190-watts, it works equally efficiently on inverter which means power cuts won’t turn you into melting ice cream. One of the standout features of the Kenstar Wonder Cool is the fragrance chamber. Just place a fragrance you like and the cooler won’t just keep the room cool but also smelling fresh and healthy. One of the few drawbacks of the cooler is that it is quite heavy as it weighs about 20kgs and its bulkier design means it best fits as window cooler rather than placing it in the room. It also does not come with wheels but you can always get Kenstar stand which will cost you around Rs. 400. As I mentioned above, it consumes more electricity at 190-watts. All in all, the Kenstar’s big build, makes it a highly durable model that easily handle the daily rigors of any household. It is also cheaper than the Crompton Greaves and is ideal for any medium to large room. 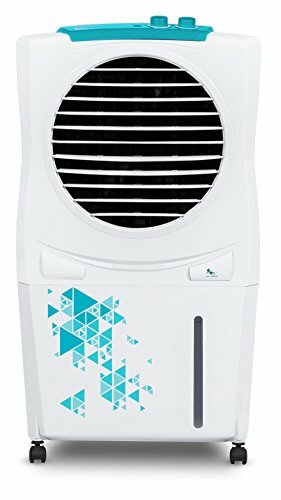 If you are on a really tight budget and need something on the cheap, this Bajaj air cooler comes with pretty much every basic feature you could have for in a cooler. What makes the Bajaj a good buy is first and foremost, the fact that it comes with honeycomb padding. So you get efficient cooling and pads that do not need to be changed regularly even with a cheaper cooler. And with 3-speed control, you get to adjust the speed of the fan based on the weather and the cooling you prefer. The 4-way air deflection technology is designed to transfer the cold air to a wider area but exactly how big a room can the cooler cool? Well, any room within a range of 140 sq. ft. can be cooled within 25-minutes and supporting that is 25-liter tank which is actually even more than you get with the Symphony Ice Cube. This helps you enjoy the cool breeze without having to go about filling up the tank every couple of hours. If you are looking for a more precise number, its runtime is around 5-6 hours. The large water indicator in the front of the cooler gives you a precise indication of when the cooler needs more water so you do not have constantly check up on it by removing the pads etc. (it is hassle-free, just how a cooler should be). Wheels at the bottom and a weight of just 8kgs give it excellent portability so you can move it from one room to another without the need for summoning your inner hulk. And it does not need any special stand or designated place either due to its low profile which means you can have it placed anywhere you want it to. Last but not least, it is the most energy efficient cooler on the list which means it works at less than 80-watts (because the weather is not always the reason for the sweating). You can also hook it up with your inverter in case you live in an area with high power cuts. 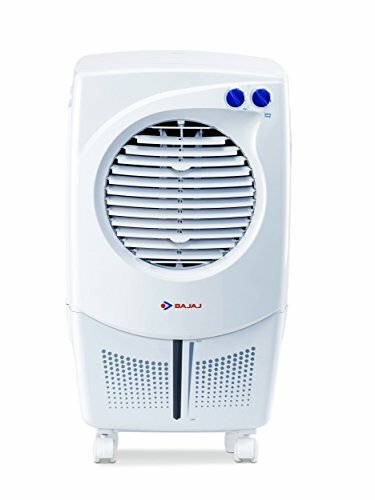 One of the few reasons we like the Symphony Ice Cube over this Bajaj model as our budget pick is because this cooler does not come with any ice chamber so there is no way to fasten or get more cooling out of it. It is also noisy and prone to water leaks as the opening for refilling clearly has room for improvement. Also, it lacks the durability of the Ice Cube as the pump may give way faster due to wear and tear. This cooler too will work effectively in small rooms. Suitable for small rooms of about 140 sq. ft. This Bajaj Cooler is one of the most basic coolers you will come across both in design and features. Yup, you do get the much-liked and efficient honeycomb padding and decent durability which makes it well worth the low price and ideal for anybody looking for a cooler on the cheap. After busting your as* at work the whole day, one thing everyone looks forward to is the comfort and cozy feeling of the home but what if your home starts to feel like an oven instead? Terrible right? Well, to make your home your happy place again without having to pay 40-50k for an AC (especially if you live in a low humidity zone), our buyer’s guide is just you needed.